Edith Stein- Writer, Convert, Martyr | House Unseen. Life Unscripted. Tommy: X? Why X? Who in either of our families is named X? Me: Well, no one I guess. But there's a saint X! Tommy: There's a saint everything, woman. That doesn't mean we're gonna name our kid, I don't know, Eustadiola. Tommy: What does that mean? Me: Sibling A of yours has already named his/her son/daughter that. Me: With ALL the awesome saints throughout all of history you wanna reuse a first name from this very generation? Because you like confusing people? Lizzy: Is there a Saint Barbie? This time has been no exception. So the other night I hopped onto Jennifer Fulwiler's Saint's Name Generator and prayed for a little divine intervention. And guess what? Sometimes the answer to our prayers is "no". Boys names and already-played names all in a row! So I gave up my insta-baby-name dreams but immediately remembered that I had used the same name generator to get my personal patron saint for the year back in December. Had I read about her since then? Had I prayed for her intercession? Had I thanked God for giving the gift of her wisdom and selflessness to the world? Sometimes the answer to my long list of rhetorical questions is "no". Do you know about Edith Stein? 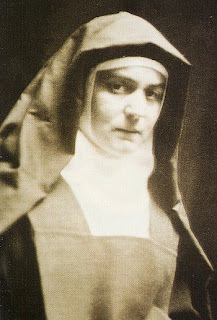 Born Jewish, turned atheist, converted to Catholicism, took the name Teresa Benedicta when she became a Cermelite nun and was then executed at Aushwitz in 1942 Edith Stein? Apparently the Holy Spirit's answer to my prayer back in December was a resounding YES but I guess I wasn't ready to listen. A friend from our parish calls these kinds of things God-incidences because "coincidence" implies chance. Being matched up with Teresa Benedicta of the Cross for this year was definitely not mere chance. She a convert. I a convert. She a student of phenomenology in the early 20th century. I a student of phenomenology in the late 20th century. She was a philosopher. She translated Aquinas from Latin into German. She gave lectures. She wrote books. This world is temporary for us all. How can we best use our God given talents in the short time we're here? How will we prepare for the eternity which inevitably follows our passing? How will we seek justice for those who are voiceless and oppressed? That embraces my being and buries it in yourself." I was given St. Gianna Molla as a patron saint years ago. Like, three children ago. Hmmm.....now, I try not to think about her or speak with her unless I'm already pregnant. Edith and I have been friends in Christ for a long time. If I'd had another child, I mighta picked her....As it stands, she is patron of my blog. I really do love St. Edith Stein. I've always had a profound respect for her. On another note...a little baby named Theresa or Benedicta (kind of fun) or even Edith would be so precious ;) Good luck with the rigorous naming process! "You are the space that embraces my being..." How lovely. Charles painted an icon of St. Edith Stein. I'll try to find an image of it and email it to you! Also, Anne Frank's full name is Anneliese. Those conversations are pretty funny and sound eerily familiar, except I'm the one who is determined that the names honor both a family member and a saint! Luckily most of our family members that we want to honor do have a saint's name! Good luck. I look forward to reading about Edith. I'd actually never heard of her! I love St. Edith Stein, too. It must be my penchant for Carmelites. I wish you the best in finding a good saint's name for your baby. Ahem -- I believe Angie is discussing me, as her friend who talks about baby names a LOT! I'm just glad I'm not the only one who stresses about it!! We're leaning a little more Irish in our family - go figure! I'm off to read more about Edith Stein now and expand my vocabulary with words like phenomenology. Thanks so much for stopping by and linking up this wonderful post to Saints and Scripture Sunday! Hope you're feeling good, and hope to see you again soon!